Earlier in the year HPN ran a preliminary All Australian team, based on the Player Approximate Value system that we have developed to determine the value of players. With the announcement of the “real” All Australian team imminent, we thought we’d add to the noise and drop our thoughts in the mix. AA40: Nathan Wilson, Zach Tuohy, Mitch Duncan, Robbie Tarrant, Mark Blicavs. 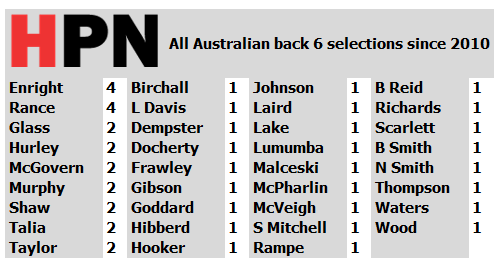 The All-Australian selectors, given the difficulty rating defenders, has a strong tendency towards a “Rance plus novelty” approach. Aside from Rance who has long been the standout defensive player in the league, and Enright before him, the last decade of AA teams is filled with first and a few second time selections. These players often first were selected the year the public and media noticed them doing a good job, then stopped being selected in favour of newer entries, even though those previous players probably didn’t actually get worse. The HPN All-Australian backline for selects itself fairly easily, with structure being catered for pretty simply by choosing the six players with the highest 2018 defensive value. PAV allocates value scaled to how good a team is, and as it happens, this list is exclusively filled by defenders from the best four defensive sides. Everyone recognises that individual contribution to defence is hard to rate, but surely the actual results of the defending have to be a key factor. These are the most valuable defenders in the defensive setups best able to prevent scoring on a “points per inside 50” basis, and we’ll back it strongly against “golden fist” style eyeball takes anyday. The Defensive PAV ranking approach gives us two genuine tall defenders in Davis and Rance, two mid-sized and flexible defenders in Stewart and Rampe, and then two contrasting smalls in Shaw and Lloyd. The next in would be Robbie Tarrant from the 5th-best defence of North Melbourne, and Mark Blicavs. Any competitors for small defender positions sit a little further back, but Nathan Wilson has been commendable for a relatively poor Freo side this year. If he had a more consistent role down back, Mitch Duncan may have been in with a shout as the final rebounding half back, but we’ve opted for specialists instead. Of our team, three were snubbed from even the 40 player squad of the real side (Davis, Shaw and Rampe). AA 40 Mids: Luke Parker, Patrick Cripps, Scott Pendlebury, Callan Ward, Jack Steven. AA 40 Rucks: Max Gawn, Callum Sinclair, Todd Goldstein. Brodie Grundy takes the sole ruck spot in the side, and unlike most hypothetical sides, HPN couldn’t find room for Gawn as well. As we wrote a few weeks back, almost every side runs a sole primary ruckman, and both Collingwood and Melbourne are the most extreme for doing so. Both rest for about 20% of a game, and it isn’t worth wasting a bench rotation (or the role of an elite player) to cover that little time. The All Australian side is meant to reflect a real team – having two near sole-role rucks doesn’t do that in 2018, no matter how valuable they are. By the way, the gap between Grundy and Gawn was tiny by the end of the year, and it might be the closest call of any in this team. If you were picking the most valuable team of 22 players (without regard to position), you may even have to pick four or five rucks, such is their elevated role and value this year. Ruckmen now dominate score launches for the league, and sit at the top echelons of score involvements too. Yeo sits on a wing, and could be regarded as one of the few real “wingers” in the league with his long runs, penetrating kick, and tendency not to play exclusively in the back half of the ground. However these days the “wing” is more of a location on the ground, the site of long kicks up the line to marking targets, and less a genuine positional role. Indeed, even Yeo often finds himself inside the square, or running off the back of it, at bounces. At centre bounces, the “wing” is often sacrificed for configurations such as spare men attacking from the back of the square. Selwood, on the other wing, is far from the typical ideal for a winger, but as he will be often the release player and crashing bounces from the back or side of the square, this will matter little. In reality, both these guys would likely slide behind the ball at centre bounces, with one playing as a spare in defence and the other likely crashing the bounce. The other three names pretty much write themselves in. Don’t believe the hype about Martin and Dangerfield having down years; they are mostly just being used slightly differently. They are still in the top 1% of the competition, which is what you’d ask for from either player. The man at the top of the PAV charts after the Home and Away season, however, is Tom Mitchell, who made a slight leap forward on his previous high value. His quality, to anyone who seriously watches football, is undeniable, as is his importance to Hawthorn. Like most years, midfield is the hardest to make cuts on. On pure midfield value Patrick Cripps nearly gets a nod on the bench, and if the “name Martin/Dangerfield forward” trick is used, Luke Parker might come in. There are probably 20-25 midfielders who could seriously argue for consideration this year, and only eight or nine spots in this side. It’s a tough game for these guys, but we suspect they are being adequately rewarded in other ways. AA40: Tom Hawkins, Josh Jenkins, Jesse Hogan, Robbie Gray, Jack Ziebell. This forward line might look tall, but should actually be well rounded enough to work. Hear us out. Lance Franklin, as most know, does most of his work outside the 50, looking for targets (or goal) from long range. He missed four games this year but still managed to rate at the top of the table for total offensive value, such is his output. Jack Riewoldt also gets the ball outside 50 a bit, but he also leads to narrow angles a bit and dominates in 1v1 contests. And there are few (if any) better lead up forwards than Ben Brown right now, and he operates best when he gets the corridor to himself. Tom Hawkins, who misses the team by a narrow margin, would also fill a similar role to Brown, but without the ability to effectively chop out Grundy in the ruck (alongside Westhoff). Dayne Zorko might slide up to a HF/wing combo on the front edge of the square to create more space for the forwards, and to draw a defender away (and maybe even sneak a long tap). It’s hard to have two players in similar roles in the same AA team, but the performance of both Gunston and Breust this year has been undeniably good. They’ve combined for 101 goals and 39 goal assists this year, plus a bunch of inside 50s and even some clearances. While the claims of others are strong, theirs is stronger. Int: Justin Westhoff, Shaun Higgins, Clayton Oliver, Bryce Gibbs. The AA bench is typically regarded as the place to dump the “next best” midfielders, but Westhoff is really better than a bench player in those terms. Being the most flexible player in the league (able to play practically every role), we’ve left him on the bench because he plays everywhere and this represents his flexibility. The other three (Higgins, Oliver and Gibbs) fit the stereotype a bit more, but all three play slightly different roles, and will hop in the rotation differently. OK, maybe we lied about the Grundy/Gawn call being the hardest. How do you evaluate the worth of a coach? Is it the coach that has been able to win the most games (Hardwick)? Or the side that was most inventive through the year (Cameron) or able to use a flawed side to the best of their abilities (Scott brothers)? Or even a maligned coach who was able to cover injuries and still coax his team to a double chance (Richardson lol no, we mean Buckley)? In the end, we have gone for the coach that has outperformed our preseason predictions by the most – namely Alistair Clarkson. It’s hard to disagree with the fact that he is probably the best coach in the game right now, so this seems fitting. So there you have it, our All-Australian team and squad. Interesting that only 1 Eagle made it into your top 40, Elliot Yeo. That seems strange as they came second on the ladder. Is there an obvious explanation? Home ground advantage, even spread of contributors, good fixtures? – Gaff missed too many games to get the nod, and if he played 22 he probably would have made the 40 at least. – Shannon Hurn and Jeremy McGovern can’t have been far away from their squad of 40. I think there’s a case for both of them. – Josh Kennedy and Jack Darling were both elite when playing, but missed 6 or more games, so no chance of making an AA side. – Luke Shuey and Jack Redden were both occasionally brilliant for patches of the season, but not overall consistent for the whole year. – A lot of role players like Jamie Cripps, Liam Ryan, Willie Rioli, Liam Duggan, Brad Sheppard, Scott Lycett were an under-rated component of WCE’s success. I think the biggest surprise is that Steele Sidebottom isn’t in their squad of 40. Had an immense year. Cheers for that – we missed the comment in our spam initially (spam filter is working now). He actually repeated the question to me on Reddit and got an answer there. It’s basically what you said, including evenness in the midfield and forwards missing games. Also Hurn and McGovern were a bit behind the named defenders at stronger defensive teams, but not far off.